We get it. Wedding dresses are fabulous. Wedding cake is delicious. Wedding flowers and décor are amazing. But beautiful weddings just don’t happen. They’re planned. Celebrating with couples on the most important day of their lives is a meaningful experience. Making sure a bride and groom, alongside their families, get to enjoy their wedding day is the ultimate goal. That being said, let’s get a few things straight. . .
It’s nothing like what you’ve seen on TV. . . Some visions are bigger than budgets. . . Your feet will hate you. . .
Not all __________ (insert any participant in a wedding day– brides, grooms, bridesmaids, groomsmen, vendors, guests) are nice. . . Unless you are Storm from X-Men, you have zero control over the weather. . . Occasionally, an eight hour shift is known as “setup”. . . This wedding thing isn’t a game. Not every wedding has an unlimited budget or VIP vendors. Not every wedding has custom built tents or oozing lush florals. What every wedding does have is two people who are simply mad about each other. Two people, out of the billions of people in this world, have chosen each other…have chosen love. They want to build a life together…start a family together– and it all starts with their wedding day. And they are trusting you to make it magical, memorable and meaningful. There are few moments in life we all hold dear. Being chosen to be a part of someone’s wedding day is an honor. There are no dry runs, do overs or tap outs. You get one shot. So, more than just loving weddings– Are you a creative problem solver? Love people? Have a niche for design? Enjoy entertaining? We’d love to meet you! We are looking to expand our team with interns and associate wedding planners for the 2017 wedding season. 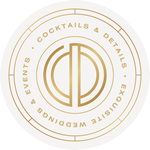 Working as an associate wedding planner with Cocktails & Details offers flexibility, unlimited income opportunities and creative career growth under our renowned brand. Our internship program is perfect for those with an interest in the wedding industry and a desire to take it to the next level: reality. Wheels spinning? Good. Tell us more about you! We’d love to meet you and see if we are a match!